Some of the most majestic skyline views in all of Mexico can be seen in San Miguel De Allende. UNESCO World Heritage is situated on a hill where cobblestone streets cover the grounds of the city, giving panoramic views to just about any rooftop. 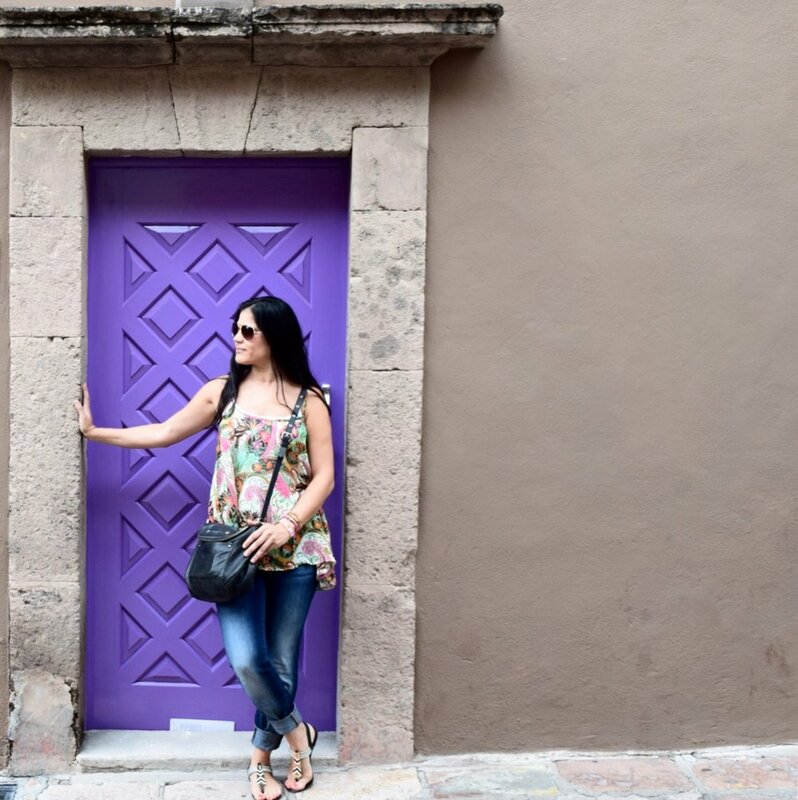 During my last visit to San Miguel De Allende, I got to experience some of the best that San Miguel has to offer with their baroque Spanish architecture, cultural festivals and thriving art and food scenes. Guanajuato wineries and vineyards are also located about 20 minutes from the center of SMA. You can read about it here and here. But most of all, I was able to visit several rooftop restaurants with 360 degree views of San Miguel that can be seen from every direction. 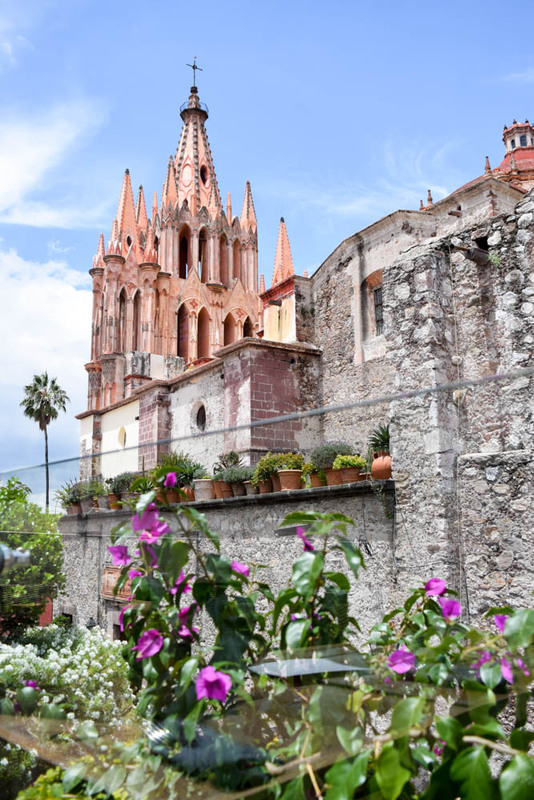 One of the most magical spots in town is La Parroquia de San Miguel Arcángel, whose dramatic pink towers rise above the main plaza, “El Jardín”. El Cielo offers one of the best unobstructed views of La Parroquia and the towns Plaza, where cultural festivals can be seen from the top, as they walk through the streets. This restaurant offers traditional Mexican dishes and local wines from the state of Guanajuato and Mexico. Come for the wine and views! If you ever visit SMA you have to visit popular Rosewood San Miguel de Allende Hotel. Their rooftop bar Luna is located at the top level offering majestic view of the entire city. This is a beautiful hotel and restaurant with an impressive wine list with a large variety of Mexican producers, Old World and New World wines. La Parroquia is further away, but panoramic views of the other side of San Miguel covers the scene and are spectacular. Delicious tapas, dishes and exotic cocktails are available to dining or apetizers. This is a must visit and makes for the most beautiful wedding! One of the best things to do in SMA is walk the cobblestone streets that cover the city. We found this restaurant doing just that and had the most delicious meal! This restaurant was nicely decorated in modern décor offering the close views of La Parroquia from a different perspective then “El Cielo”. The food was exceptional and the drinks were made by in house mixologist. Due to the fact that cocktails is what they do best here, I decided to skip the wine and I ordered a Raspberry Watermelon vodka drink topped with a chilli lemon powder and a rose petal. A Bloody Mary and Michelada cart was also available for brunch. I highly recommend everything here!!! Due to it's popularity, make sure you make a reservation, otherwise you're stuck at the bar. Pictured on the below is a breakfast restaurant we found by accident right across the street from "El Mirador". Consequently this restaurant was called "El Mirador". This restaurant was like eating at someone house with impressive views and a home cooked meal. Actually, it was someones house and it was a home cooked meal!!! Regardless, we had the best breakfast and had the best view of SMA. If you visit SMA, you have to ask around and find this churro place pictured below! It's the best churro spot and it was recommended to me by several people. We waited in line forever for the churro, but it was totally worth. I can't remember the name of this place, but it's near the central park and when you see the long line, you know you found it! Another must thing to do in just walk around the entire town. Most of the hidden spots we found was by walking around. Theres so many beautiful building to see all very unique and not one in the same. The streets and architecture are colorful and a true representation of what Mexico is like. You can also walk over to the market and buy yourself some artisan handmade goods. Or simply take in the views and all the burros and people! Beautiful wineries, picturesque rooftops bars, baroque architecture and an exceptional gastronomical scene, are the reasons why tourist’s from all over the world continue to make San Miguel one of the most popular tourist and retirement destinations in Mexico.